Reliance Jio has announced a new Dhan Dhana Dhan offer for its Jio Prime users. Under this offer, Jio Prime users will get 100 percent cash back if they recharge with Rs 399 before October 18. If they currently have any other recharge pack running, they can still recharge with Rs 399 and their recharge will be effective after the current pack expires. The new Dhan Dhana Dhan offer is available from today that is October 12. And the offer ends on October 18. Jio is calling it a Diwali gift for its users. While the offer sounds great right — it’s Jio after all — there are several terms and conditions to enjoy this offer. Under this offer, Jio users will get 100 per cent cash back on recharges of Rs 399. That is true. 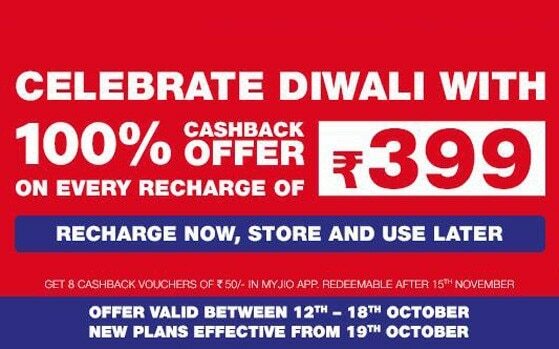 But it is a limited time offer because only the Jio Prime users recharging their phone numbers with the Rs 399 plan by October 18 will be eligible for the cash back offer. After recharging the Jio number with the Rs 399 planthe Jio user will get 8 vouchers of worth Rs 50, which in total accounts for Rs 400. The Jio users will be able to redeem these vouchers against their future recharges of Rs 309 or above and Rs 91 or above data add-ons. But then there’s a catch. The vouchers can only be redeemed after November 15, and the Jio users should redeem only one voucher at a time and not all at ones. While recharging, the customer can produce one of the 8 Rs 50 vouchers. This means that users, after applying the voucher will have to pay Rs 349 (Rs 399 – Rs 50 = Rs 349). Under this plan, Jio offers 84GB of 4G data to its users with a FUP limit of 1GB. Customers recharging with Rs 399 will also get unlimited voice calling facility, free SMS and subscription to any Jio apps. The Rs 399 offer is valid for 84 days. This offering is for the prepaid users. For the postpaid users, under the Rs 399 plan, Jio offers almost the similar services, except for the three billing cycle’s validity. While announcing the new Dhan Dhana Dhan offer, Jio also mentions that it may announce a revised set of tariff plans for its users on Oct 19. The company writes, “New plans effective from October 19”. However, the company hasn’t cleared mentioned any details on the same of yet.